MENEMSHA - With an honor guard of family members at hand to bring them home, the bodies of John F. Kennedy Jr., Carolyn Bessette Kennedy, and Lauren Bessette were recovered yesterday from their wrecked plane on the rippled sand of the ocean floor. Condolences The Kennedy Library and Museum at Columbia Point in Dorchester announced its lobby will stay open until 9 tonight to accomodate mourners who want to sign a condolence book. Searchers found the plane and bodies of John F. Kennedy Jr., his wife, Carolyn Bessette Kennedy, and her sister Lauren - a discovery many had likened to finding a needle in a haystack - using a remote-controlled, camera-equipped vehicle made by a Falmouth company. A piece of the fuselage and the bodies of John F. Kennedy Jr., Carolyn Bessette Kennedy, and Lauren Bessette were found yesterday. Searchers used a range of techniques to zero in on their target. SONAR identified debris on the sea floor ant 8:45 p.m. Tuesday that searchers thought looked suspiciously like the airplane. A REMOTE- CONTROLLED VEHICLE with a camera found and 8-10 foot section of the fsuelage at 11:40 p.m. Tuesday. A vehicle like the one used by the Navy. DIVERS wearing hard-hat diving helmets and using surface air found the bodies yesterday at 10:30 a.m.
Kennedy's family requested a burial at sea, and the Pentagon granted that request. The Navy destroyer USS Briscoe was headed toward Cape Cod to participate in a mariner's funeral tentatively scheduled for this morning, pending completion of an autopsy, government officials said. Burial plans for the Bessette sisters were not announced. The discoveries and the sight of Senator Edward M. Kennedy leading his two sons on a sad mission brought an emotional end to what began Saturday as a hopeful effort to find survivors. By Sunday night it had turned into a sober search for the remains of a celebrated young man with a unique pedigree, his glamorous wife, and her investment banker sister. Their bodies were found together in the twisted ruins of the Piper Saratoga II that crashed Friday night as Kennedy was piloting it toward what had promised to be a weekend of summer fun and the wedding of a Kennedy cousin. The 8- to 10-foot-long section of fuselage where the bodies were found was located by a robot dive vehicle in 116 feet of water roughly 7 miles off Martha's Vineyard. When three shiny metal caskets were taken off a Coast Guard cutter at Woods Hole late yesterday afternoon, four cousins of John F. Kennedy Jr. - Patrick, Edward Jr., Douglas, and Max Kennedy - joined two Coast Guardsmen as impromptu pallbearers. Standing beside them were Edward Kennedy, his wife Vicki, and a priest. Edward Kennedy and his sons, Patrick and Edward Jr., had gone out to the Navy salvage vessel USS Grasp to retrieve the latest young family members who had met sudden deaths. A memorial Mass for Kennedy, 38, and his 33-year-old wife will be said tomorrow morning at the Church of St. Thomas More in Manhattan, where his mother, Jacqueline Kennedy Onassis, sometimes prayed. President Clinton and Hillary Rodham Clinton are scheduled to attend the private Mass. After her brother's body was found, Caroline Kennedy Schlossberg and her husband went for a bicycle ride near their summer home in Bridgehampton, N.Y. She made no public comment. An invitation-only service for Lauren Bessette, 34, is scheduled for Saturday night at Christ Church in Greenwich, Conn. ''We believe that our children are with us in spirit each and every moment, and that is what helps sustain us,'' their mother, Ann Freeman, and stepfather, Dr. Richard Freeman, said in a statement. The recovery effort began after a device deployed by the Grasp called a remote operated vehicle discovered a large portion of the plane's fuselage. The discovery at 11:40 p.m. Tuesday was confirmed when a camera aboard the underwater vehicle spotted the Piper Saratoga II's registration number, N9253N. They saw Kennedy's body, still strapped inside. The first dive to the site began at 10:30 a.m. yesterday, during which two divers from the Grasp spent 40 minutes on the ocean floor, where visibility was 5 to 8 feet, and identified all three victims. At midday, a Coast Guard helicopter touched down at the Kennedy family's Hyannis Port compound to collect Edward Kennedy and his two sons. With the last surviving son of a storied generation of Kennedys leading the way, the trio was taken by boat to the Grasp. At 4:30 p.m., the victims' bodies were raised to the surface. Larrabee declined to discuss the conditions of the bodies. ''They were brought up in a way that I think respected the situation that we were in, and I guess I don't need to add any more to that. It was something that we were very, very sensitive to,'' Larrabee said. 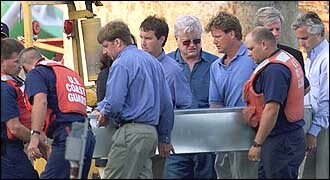 A Coast Guard cutter with Edward Kennedy and his two sons aboard then brought the bodies to Woods Hole, where they were placed in two white medical examiner vans that drove slowly away. Autopsies were to be performed at Barnstable County Hospital in Bourne by the state pathologist, according to the office of Philip Rollins, Cape and Islands district attorney. He said the salvage operation should be completed within the next few days, and he said he expected almost all major parts of the plane would be recovered. As the salvage work ended yesterday, there were still some pieces of the plane's wings that had not been recovered, though Larrabee said they were spotted 20 to 40 meters from the fuselage. News of the recoveries was at once a relief and a cause for tears for family, friends and strangers who waited for word. While the recovery marked an emotional transition for the public, for investigators it promised to provide a wealth of information in the painstaking effort to learn what went wrong. A final report is not expected for six to nine months. The autopsy could determine whether the three victims were killed by the trauma of impact or - based partly on whether there is water in the lungs - survived the crash and drowned, said Michael L. Barr, director of the Aviation Safety Program at the University of Southern California, a training center for crash investigators. However, Dr. Cyril H. Wecht, the Allegheny, Pa., County coroner, said that after five days in the ocean there almost certainly would be water in the lungs, regardless of how they died, making a determination of drowning questionable. Wecht said the bodies would be X-rayed for broken bones, and a review would be undertaken to determine if a heart attack or stroke could have incapacitated the pilot. Toxicology studies will be used to learn whether Kennedy had taken any prescription or nonprescription drugs. Kennedy injured his ankle in a paragliding accident several weeks before the crash, and witnesses said he was limping during his preflight inspection Friday night. Investigators want to know whether he had taken painkillers before flying, Barr said. Tests also will determine the amount of carbon monoxide in his blood, an excess of which would suggest engine troubles. A less technical part of the investigation will focus on Kennedy's behavior before he set foot in the cockpit. A key factor in many small-plane crashes is pilot fatigue, Barr said, so investigators will try to reconstruct his final days. Preliminary clues as to whether there was a mechanical failure will be evident almost immediately, Barr said, though a full review of the plane's engine and other parts will take weeks. For instance, if the tips of the Piper Saratoga II's propeller are curled inward, it will lead investigators to believe the propeller was still spinning at the moment of impact, Barr said. The tighter the curl, the faster it was spinning. By contrast, if the propeller is bent but not curled, it most likley was not moving at the time of the crash, possibly as a result of engine failure or fuel exhaustion, Barr said. Investigators will be able to determine whether the plane ran out of fuel. That is considered unlikely, however, unless a leak is found; five days before the flight, Kennedy purchased 62 gallons of fuel, more than enough to make the trip from Essex County Airport in Fairfield, N.J., to Martha's Vineyard several times over. A close examination of the plane's instrument panel is expected to reveal key missing details of the final moments. The crash likely created tiny nicks on the instrument casings known as impact marks that will record the readings at the moment the plane hit the water, Barr said. Investigators will look for marks on the airspeed indicator to reveal how fast the plane was going. Marks on the attitude indicator will be used to determine the angle at which Kennedy's plane fell from the sky. A third instrument, the vertical velocity indicator, is likely to reveal little beyond what is already known. The gauge only goes to 2,000 feet per minute, while radar reports indicate the plane was descending in excess of 5,000 feet per minute. ''If they find nothing wrong, they can disregard mechanical failure and turn their attention to human error. They always try to prove mechanical error first,'' Barr said. Barr, a military pilot in Vietnam and former military flight instructor, said a majority of the small plane crashes he has investigated were caused by human error. He declined to speculate on Kennedy's crash, but other aviation authorities have said Kennedy might have grown disoriented on his approach to the island airport and sent the plane into a spinning plunge into the ocean. That scenario appeared consistent with radar data released Tuesday that showed Kennedy made several unexplained maneuvers in the final minutes of the flight. If one or both wings came off in flight, the tears would indicate upward pressure on the wings. If the plane was intact when it hit the water, the wings would be ripped from the fuselage from the front to the rear of the plane, creating different tear patterns. Investigators also will examine parts of the plane including various cables, the flaps on the tail and wings, and the rudder, to see if they were attached and what position they were in at the time of the crash. ''They do not want to impeach [Kennedy] without exploring all the possibilities,'' the source said. Matthew Brelis and Stephen A. Kurkjian of the Globe Staff and Globe correspondents Jennifer Babson, reporting from Menemsha; S.I. Rosenbaum, from Otis Air Force Base; and Richard Weizel, from Greenwich, Conn., contributed to this report. Mitchell Zuckoff reported from Boston. This story ran on page A01 of the Boston Globe on 07/22/99.